Ipswich means to do its best for King and country by finding men for the new armies, so that in years to come the finger of reproach cannot be pointed at it by other places. Moreover, the inhabitants are pardonably anxious that they should show themselves deserving of the honour of having Lord Kitchener, the organiser of these armies, as High Steward of the borough. At the first call hundreds of Ipswich men flocked to the colours, and the recruiting has been well sustained, although the recruiting meetings have been only two. Still Lord Kitchener calls for more men, and a special effort to accelerate the enlistments is now being made in the town. It is being undertaken by a large number of energetic ladies, and they inaugurated on Saturday what is known as the Ipswich Ladies’ Recruiting Week. Quite wisely they started it off with an elaborate military and patriotic procession, for is not the spectacular always a great attraction? This took place in the afternoon, with the sun shining approval and more than half the inhabitants in the streets enjoying the bracing air and stirring spectacle. Those taking part assembled in the neighbourhood of Barrack Corner, the time appointed being 2:15 p.m., and punctuality was observed, so that the whole procession was on the move within two or three minutes of the time fixed for starting, namely, half-past two. Mr. J. Ffloyd Peacock acted as marshal and was early on the scene to direct the movements of the arrivals while Col. F. G. Bond who had carried out most of the preliminary organisation work relating to the procession was also in evidence, wearing his black-braided uniform as a Colonel of the old 1st Suffolk Volunteers. The procession was headed by mounted police, and next came the band of the Salvation Army under Mr. W. Knights, and headed by the Army colours, flanked by the white and red ensigns. Then followed a number of splendidly-decorated motor-cars. These included the car of Lady de Saumarez, representing Belgium, carrying the national flags and a Belgium soldier in uniform, Mrs J.H. Egerton, whose car, representing France, was adorned with several of the national flags. Mr. C.H. Berners’ car, in which two large brown bears were standing on their hind legs, one of them holding aloft an effigy in miniature of the Crown Prince, who dangled in his hand an iron cross. Other Russian emblems were to be seen, including a large flag containing the Russian arms across the back of the car. Mrs. Stuart Paul had a car decorated to represent Japan, flags and white chrysanthemums being the chief feature, and the Colonies car was provided by Mrs. Russell Paul and Mrs. Harry Paul, the names of the various Colonies being exhibited in the midst of flags and other decorations. One of the best efforts was the car representing India. The passengers were made up as Indian officers in turban and khaki uniforms, and they had leopards’ skins as rugs. Palms waved over them, and in short, the representation was quite a touch of Eastern splendour. So well disguised were the passengers that their greatest friends did not recognise in them Councillor Frank Mason and Mr. Percy Bennett. The car for Great Britain (Sir F.W. Wilson) had a fine picture of Lord Roberts in the front, surrounded by laurel leaves, and a toy lion also formed a feature of a decorations, while a Boy Scout rode in front, and national flags, great and small, adorned every part of the car. Plenty of blue was the feature of the Navy car, provided by the Hon. Mrs. Stanhope Tollemache, and beneath the Union Jacks and white ensigns sat the Hon. Stanhope Tollemache, the Hon. Mrs. Stanhope Tollemarche, Captain Cayley, R.N. (Commanding Officer at Shotley Barracks), and another naval officer. The Northgate Street Depot (Mrs. Clement Cobbold) was represented by Red Cross insignia, a significant item being the box on the front. The Social Settlement was represented by Sir Daniel Goddard’s car, and the Y.M.C.A. car had been very elaborately prepared by Mr. H. Dixon Phillips. The Excelsior Club car provided by Miss Layard proudly informed the world from the midst of a profusion of flags that fifty members had gone to the front and more were following. The Missions to Seaman had a well-decorated car in the procession on the front of which was a ship and a representative party of passengers inside. Following the cars came three two-horse wagonettes and three landaus full of mothers who have three sons or more serving their King and country. Next fell upon the ear the clank-clank of gun and limber wheel, and a fully horsed and equipped battery (one of the R.F.A. Brigade at Ipswich) came into view. The battery was followed by a dismounted detachment from the same brigade, the others in charge being Capt. Clarken, Second-Lieuts. Ethelstone, Stickland, and Gooch. What war has meant to the town has never come more forcibly home to those who take some interest in Territorial matters than by the fact that, although Ipswich supplies six units, not one was present – all on service away from the borough. The only representatives of the Force present were a smart company of the 4th Northamptons, under Capt. Everett. They carried rifles and bayonets and are a sturdy lot. “It’s a long, long way to Tipperary” was the favourite tune played by the Town Mission Band, under Mr. E.J. Joyce, who headed a detachment of the St. John Ambulance Brigade under Supt. J.T. Brooke. Their familiar uniform brought to one’s mind the noble service many of its wearers are rendering the British Army, aye and Navy, at the present time. Supt. Galloway came next with eighteen members of the Ipswich Fire Brigade in full uniform. Then came hundreds of strong, healthy typical English lads, who, by participating in the procession, will have something to remember about the great war when they are full of years. They were all in uniform. The Church Lads’ Brigade, numbering about 60, were under the command of Capts. Offord and J. Bell, the Boys’ Life Brigade, with their fife and drum band, were under the command of Capt. Goddard, the two last-named corps numbering 16 officers and 121 non-commissioned officers and lads; and the Boy Scouts, numbering 6 officers and 128 rank-and-file, were under the command of Scoutmaster Hicks. The route was St. Matthew’s straight through to St. Helen’s, and via Grimwade Street, Rope Walk, Tacket Street, Butter Market, to the Cornhill. In some places the spectators stood five or six deep, and frequent cheers were made, the delight of the youngsters being manifest. In short, the procession was a great success. 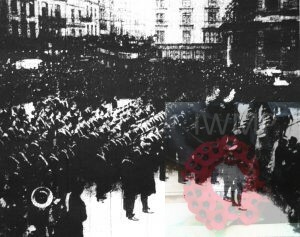 An immense crowd assembled on the Cornhill, and a space was kept clear in the centre by a number of the R.F.A., for the various corps in the procession to occupy, preparatory to listening to a number of speeches delivered from the Town Hall steps. It was indeed a remarkable sight which met the gaze of anyone looking through the windows of the civic building. Massed in the foreground were row after row of men and boys in many different coloured uniforms, in the background and at the sides were thousands of the inhabitants, the winter colours of the ladies’ hats and costumes adding warmth to the picture, while higher up could be seen more spectators at every window overlooking the square. It was not long before the eye picked out a number of wounded Belgian soldiers from the Nurses’ Home, in charge of two nurses, who were perched on a balcony opposite the Town Hall. Our brave Allies were in civilian clothes, but their bandages were, alas still discernible. In a window at the side were some British wounded soldiers from the local hospitals, and they were as full of jollity as if they were at a Christmas party. 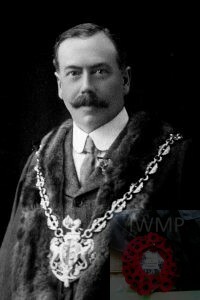 Inside the Town Hall were a large number of members of the Corporation and their wives, together with the Mayor (Mr. John D. Cobbold), the Mayoress (Lady Evelyn Cobbold), who is also President of the Ladies Committee, Sir Frederick Wilson, D.L., chairman of the local Recruiting Committee. Mrs. Rowley Elliston (vice-president), Miss Eva Fisher (hon. secretary), Mrs. Norman Everett (assistant hon. secretary), Mrs. Clement Cobbold, Mrs. G.A. Cobbold, Mrs. Key, Miss Layard, Mrs. Stuart Paul, Mrs. E.F. Ridley, Mrs. G.E. Steward, Miss Walton, and Major Stuart (secretary of the Suffolk Territorial Association), etc. When the troops etc., had been drawn up the Mayor, wearing his chain and robe of office, and attended by the mace and sword bearers, proceeded to the steps and briefly indicated the object of the appeal. Major Eaton White (second in command of the 4th (Reserve) Suffolks, followed with an address, and Colonel Cleeve also delivered an address. The National Anthem was played by the Mission band and the troops presented arms. On the call of the Mayor three hearty cheers were given for the King. Sir Frederick Wilson called for three cheers for the Mayor, and Col. Bond three for the Mayoress. Yet another three were given for the Ladies’ Committee, Col. Bond, and Miss Fisher on the call of Sir Frederick Wilson. The Mayoress expressed her thanks to all who had helped, and trusted the splendid weather would continue all the week. MOTHERS OF MEN UNIQUE TEA PARTY. It was a happy thought to have included in the Ipswich Recruiting procession on Saturday, the mothers of the men who are serving their King and Country, and the reception those good ladies were accorded all along the route, and notably as they drove on to the Cornhill, past the Town Hall, was very sympathetic and where the crowd was greatest, enthusiastic. As many as possible were accommodated in three large brakes, and the rest were in landaus, and it was obvious that they greatly enjoyed the exciting experience. After the procession through the town, they were driven to the new Club, which has been started in the Butter Market for the wives and mothers of soldiers and sailors. Very roomy and convenient premises have been secured thanks to the kindness of Mr. William Pretty, who gives them free of charge; while they have been very cosily arranged and furnished for the purposes of a club-house, with reading, sitting, and tea rooms, and also a nursery for the children. This last will be the greatest of boons to tried mothers, who have to bring their children with them to the Town Hall for their periodical visits to the Soldiers’ and Sailors’ Families Association, and who have hitherto had to wait in the ante-rooms and vestibules of that building. The idea of the club-house originated with Mrs. Ernest Pretty and Miss Elsie M. Cobbold, leading spirits of the S. and S.F.A., and they and other ladies of the Association have been instrumental in establishing rest and recreation rooms for the wives and mothers of soldiers and sailors in various parts of the town. All the guests on Saturday, to the number of between eighty and ninety, were assembled at the Butter Market club rooms before four o’clock, when the opening ceremony was performed by Miss May Berners, who in graceful and kindly word wished the Club, its members, and especially those she saw present at that afternoon, blessings and prosperity. Tea, which had been provided by Mrs. Ernest Pretty and Miss Elsie Cobbold, was then served, and was heartily enjoyed by all, after their long and doubtless rather chilly drive, though its chilliness must have greatly tempered by the warmth of their reception. While they were at tea, the Mayoress, Lady Evelyn Cobbold, paid a visit and went into the various rooms. In response to a hearty reception the Mayoress said that they had done much more than she had for their country, for they had all given several sons, while she only had one, who was not old enough to serve. She said a few other kindly words to the guests, who heartily cheered her ladyship, as they had done Miss Berners; in fact, their enthusiasm broke out into open expression several times during the afternoon, and they gave an ovation to Mrs. Pretty and Miss Elsie Cobbold, as well as to other ladies of the Committee who had been making them so thoroughly happy and at home. The rooms had not only been comfortably furnished, but were gaily decorated with flags and other adornments by Mrs. Edward Pretty; Miss Trixie Pearce, the hon. secretary, was indefatigable; and other ladies who assisted in the arrangements and in looking after the comfort and happiness of the guests of honour were Mrs. Paul Ridley, Mrs Gordon Stewart, Mrs. Askew, Mrs. Colbey, Nurse Phillips, the Misses Brown, Maud Pretty, and Phyllis Pearce. After tea there was music, and some of the soldiers’ wives showed that they possessed tune and voices and an interesting and original repertory of songs. The afternoon was, in fact, thoroughly delightful to all concerned, and we venture to say that there is no other town in England where greater appreciation is shown of the near and the dear ones of those who are defending their country. A list is given of those who were present on Saturday afternoon, but it will be noted that the name Mrs. Clarke, of 43, Fitzroy Street, who has six sons, a son-in-law, and a grandson serving their country, is absent, that lady, unfortunately being prevented from attending through indisposition. It will be noted that several mothers have four and more sons serving. Mrs. Westwood, 6, Boar’s Head Lane, has six sons; Mrs. West, 90, Rosebery Road, has a husband and two sons; Mrs. Alcock, of 9, Mount Street, has five sons and two sons-in-law; Mrs. Aldous, of 27, George Street, four sons and two sons-in-law; Mrs. Barnard, of 88, Cavendish Street, bravely said that she has four sons serving and three more ready if wanted; Mrs. James, 12, Lower Orwell Street, has a husband, two sons, and four sons-in-law; Mrs. Kidby, of 10 Foundation Street, and Mrs. Barnyard, 26, East Street, each four sons and one son-in-law; Mrs Warne, 11, William Street, and Mrs. Wiggins, 48, Wells Street, each three sons, and two sons-in-law; Mrs. Brown 76, Albion Street, has four sons serving and has lost one in the war; Mrs. Butcher, three sons and one grandson; Mrs. Balaam, five sons; Mrs. Thompson, 1, Upper Orwell Street, has no lees than five sons and twenty-eight relatives in the Army. Abbott, 9, Tower Ramparts, 4 sons. Allard, 14, Melville Road, 3 sons. Alexander, 21, Upper Barclay Street, 3 sons. Allcock, 9, Mount Street, 5 sons and 2 sons-in-law. Aldous, 27, St. George’s Street, 4 sons and 2 sons-in-law. Banyard, 26, East Street, 4 sons and 1 son-in-law. Beckett, 19, Bell Lane, 3 sons. Brown, 76, Alboin Street, 3 sons; 1 lost. Brill, 40, Sirdar Road, 4 sons. Butcher, 8, Westgate Court, 3 sons and 1 grandson. Brunning, 18, Wykes Bishop Street, 5 sons. Bloomfield, 3, Austin Street, 3 sons. Bernett, 12, Tennyson Road, 4 sons. Barnard, 88, Cavendish Street, 3 sons. Balaam, 40, Cavendish Street, 5 sons. Brown, 6, Fore Street, 3 sons. Brwon (W.), 36, Wykes Bishop Street, 4 sons. Crickmore, 68, Foundation Street, 4 sons and 1 son-in-law. Cully, 57, Handford Road, 3 sons. Claxton, 82, Hatfield Road, 3 sons. Cole, 51, Hartley Street, 3 sons. Clarkson, 29, Handford Cut, 3 sons. Chilcott, 126, Alan Road, 3 sons. Chatfield, 7, Beaufort Street, 5 sons. Catling, 6, Cobden Place, 4 sons. Clarke, 965, Woodbridge Road, 3 sons. Catt, 43, Blanche Street, 5 sons and 2 grandsons. Daniells, 2, Waterloo Street, 3 sons. Elsey, 157, Cavendish Street, 3 sons. English, 77, Rope Walk, 3 sons. Foster, 6, Tomline Road, 3 sons. Fuller, 11, Elliott Street, 3 sons. Finbow, 23, Cromer Road, 3 sons. Fuller, 31, Station Street, 4 sons and 1 son-in-law. Also 12 nephews and 1 brother. Girling (E.), 34, Bulwer Road, 4 sons. Good, 22, Purplett Street, 3 sons. Golley, 10, Rosebery Road, 3 sons. Garrett, 23, Woodhouse Street, 4 sons. Grimwade, 12, Payne’s Court, Tanners Lane, 4 sons. Garnham, 20, Black Horse Lane, 4 sons. Garrod, 1, York Cottage, Bramford Road, 4 sons. Harvey, 8, Vernon Street, 3 sons. Hunt, 6, Dorking Street, 3 sons. Handcock, 51, Back Hamlet, 3 sons. James, 12, Lower Orwell Street, husband 2 sons, 4 sons-in-law. Johnson, 29, Cavendish Street, 3 sons. Jordan, 62, Sirdar Road, 4 sons and 3 sons-in-law. Kidby, 40, Fountain Street, 4 sons. Lord, 25, Lancaster Road, 4 sons. Lucas, 85, Cavendish Street, 3 sons. Lucas, 7, Perth Street, 3 sons. Mallet, 17, Bath Street, 3 sons. Milbourn, 3, Cook’s Court, Cox Lane, 3 sons. Mee, 5, Mersea Terrace, Deben Road, 3 sons. Matroni, 14, Permit Office Street, 3 sons. Mills, 7, Handford Road, 3 sons. Mann, 61, Rosebery Road, 4 sons. Manning, 17, Navarre Street, 3 sons and 1 son-in-law. Neave, 1, Cobden Place, 4 sons. Parsons, 11, Bishop’s Hill, 3 sons. Parker, 65, Rendlesham Road, 3 sons. Packard, 32, Bloomfield Street, 3 sons. Pegg, 22, Gymnasium Street, 3 sons. Parish, Henniker Road, 3 sons. Pearce, 5, Tanners Street, 4 sons. Ransome, 93, Rosebery Road, 3 sons. Roper, 1, Lady Lane, 3 sons. Reynolds, 45, Victoria Street, 3 sons. Roberts, 50, Samuel Road, 5 sons. Rutland, 55, Gatacre Road, 4 sons. Stannard, 13, Bank Road, husband and 2 sons. Simpson, 7, Bank Road. 3 sons. Smith, 448, Foxhall Road, 3 sons. Simpson, 57, Victoria Street, 3 sons. Scoggins, 44, Salisbury Road, 5 sons. Smith, C.S. White Elm Street, 3 sons. Thompson, 11, Upper Orwell Street, 5 sons – 28 relatives in all. Westwood, 6, Boar Head Lane, 6 sons. Warne, 11, William Street, 3 sons and 2 sons-in-law. Welton, 8, Providence Street, 3 sons. Welham, 19, Waveney Road, 3 sons. Wiggin, Wells Street, 3 sons and 2 sons-in-law. Wood, 41, Alston Road, 3 sons. West, 90, Rosebery Road, husband and 2 sons-in-law. In this list are the names of 84 mothers, representing 290 sons, 3 grandsons, 3 husbands, and 14 sons-in-law. In addition there is Mrs. Clarke, referred to above, but not included in the list, who has six sons, a grandson, and a son-in-law in the Army, bringing the total up to 318; while there is a widower in Ipswich, Mr. Skeffins, who works for Messrs. Cubitt at the Flint Wharf, and who has six sons in the Army and one in the Navy. Mrs. Green, of 3, Trinity Street, Mrs. R. Stopher, of 55, St. George’s Street, Mrs. R. Bennett, 27, Foundation Street, Mrs. Haddock, 37, White Elm Street, and Mrs. Sparks, 39, White Elm Street, have each three sons in the Army. Mrs. Bennett has a son-in-law in the Navy and a nephew in the Army. These figures show an average of nearly four soldiers or sailors per family for 91 families in Ipswich; and, of course, there are a great many more families represented by less than three sons.